Quality Air Heating and Air Conditioning > Articles > Air Conditioning > Do I Need to Refill the Refrigerant in My Air Conditioner? Do I Need to Refill the Refrigerant in My Air Conditioner? First of all, you cannot fill the refrigerant in your air conditioner on your own. Second of all, if you do have a low refrigerant charge in your system, you have a problem on your hands. Contrary to common misunderstandings, refrigerant is not consumed by an air conditioner. It is continuously recycled in a closed loop — or at least, it is when your system is working properly. Because of the function that it serves, low refrigerant levels can be a serious detriment to your comfort and to the condition of your air conditioning system. Fortunately, our team is here to help. 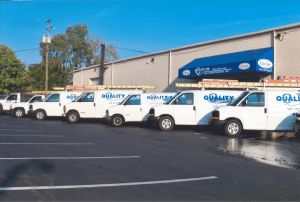 When you need air conditioning services in Columbus, OH, you need only dial our number. The refrigerant in your air conditioner plays a truly vital role in the cooling process. In the evaporator coil, the refrigerant is evaporated. This allows for the removal of heat from the air surrounding the coil. Cool air is not generated by your AC. Instead, existing heat is removed, and the newly cooled air distributed throughout the house. Not only does the refrigerant absorb the heat, but it then travels outside to the condenser unit to disperse that heat into the air. If you don’t have the right amount of refrigerant in your system, it is more difficult to remove a sufficient amount of heat from the air. Your system may start blowing warmer air, and you will likely see a spike in your cooling costs even as your comfort plummets. Because the compressor will have to work overtime to pump enough refrigerant throughout the system, you also risk this important part of the system overheating, and replacing a compressor often means replacing the entire system. If you think your refrigerant may have run low, contact Quality Air Heating and Air Conditioning right away.